Kathryn Scheer is the developer of Nicker Nickels. She was born with a passion for horses. Her life long career with horses began by working on horse farms in exchange for riding lessons. She grew up learning the conventional ways of dealing with horses, but never experienced the satisfaction of a soft connection with a horse until her exposure to natural horsemanship methods. Kathryn’s discovery that there can be a mutually rewarding relationship with a horse altered her perspective on training horses. She is currently enjoying living the dream of creating that special bond with her horses. Kathryn is a Karen Pryor Academy Certified Training Partner skilled at positive reinforcement training. 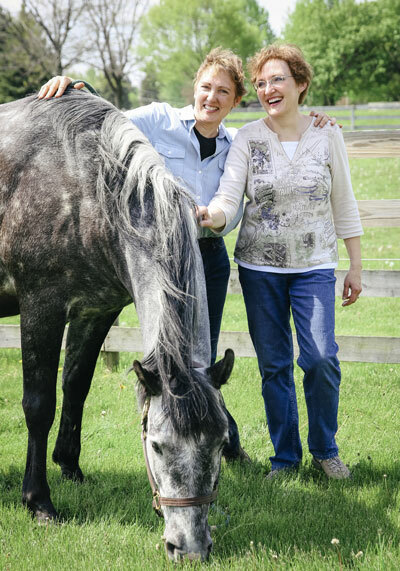 For over 30 years, Kathryn has managed a training barn and boarding facility. She has been a horsemanship/riding teacher, a certified therapeutic riding instructor and a puppy raiser for therapy dogs. The exposure to clicker training led Kathryn to seek a treat that could be eaten quickly yet be a highly desirable reward. She had difficulty finding such an item so she began to perfect a recipe on her own. Nicker Nickels is made in our own baking facility to ensure quality control. We are a family run business and are located near beautiful Racine, Wisconsin on the shores of Lake Michigan. Nancy Ryan, is part of the family as she is Kathryn’s sister. Her hard working dedication to detail, protocol and business administration has been vital in bringing Nicker Nickels from a dream to a reality. She also brings an incredibly subtle sense of humor to any situation which relieves tension when the going gets tough.